The first book from the Welfare Conditionality project has now been published. 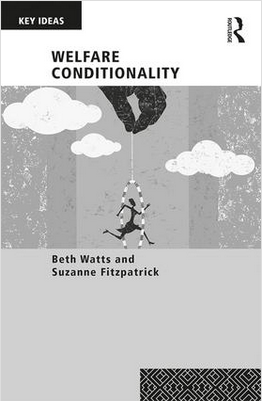 Welfare Conditionality by project team members Dr Beth Watts and Professor Suzanne Fitzpatrick charts the rise of behavioural conditionality in welfare systems across the globe, its appeal to politicians of right and left, and its application to a growing range of social problems. Crucially it explores why, in the context of widespread use of conditional approaches as well as apparently strong public support, both the efficacy and the ethics of welfare conditionality remain so controversial. As such, Welfare Conditionality is essential reading for students, researchers, and commentators in social and public policy, as well as those designing and implementing welfare policies. The book will be officially launched at the evening drinks reception at the Welfare Conditionality: Principles, Practices and Perspectives conference on 26 June, 6.30pm, York Castle Museum. Entry to the reception is free to conference delegates – there is still time to book your place before the closing date on 11 June. Click here to book your place.